Part of the problem of Craig’s blog post is that he did not define what he meant by “liberal” and “evangelical.” I have my own ideas what he meant by that, but it’s possible that if you read his blog (or this blog) that you have your own definition of liberal or evangelical. While things may seem to be black and white- many times we see gray rather than clear cut distinctions. (Yes, that is a shout out to Adam Hamilton) While I grew up in a pretty conservative church- and I still consider myself theologically conservative and evangelical- the church I grew up in might think I’m a little liberal in some areas. We have to be careful tossing around labels. So what about his blog post? It seems to me that as I talk with some of my UMC friends that there is a feeling that a split/fissure may happen somewhere in the near future. I am not sure that any side of a possible split should take preemptive measures. 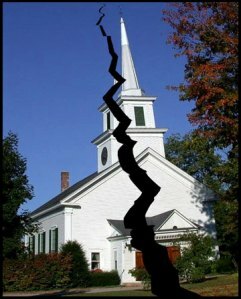 We should mourn our lack of unity in the church, and fight to find ways to preserve it as much as possible. That said, there are some issues that would cause me to question my place in the UMC. I believe that I am call to the UMC- but above all things I am called to Christ. I think that each of us has to take stock of what we believe to see if we can minister with integrity within the boundaries of our denomination (that goes for any denomination). I grew up in the UMC and have seen the Church’s impact. It is my prayer that we will listen to God and find ways to reconcile and come together rather than turning away from one another. Agree on what? Is the contemplated split over homosexuality? That won't solve anything.